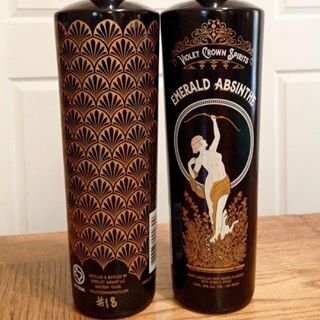 The first publicly available distilled absinthe made in Texas. Normally I get concerned when a brand markets itself as a 'low anise' style absinthe. I always warn people that there is no such thing as absinthe without anise, and that if you don't like anise, you won't like absinthe. And that's OK. Absinthe isn't for everyone. So when I first heard about Emerald I was justifiably worried. Happily, this brand is STILL an absinthe. It's just concentrated on pulling forward some other herbs as opposed to taking out anise. Louche: louching with a fountain, it builds slowly, but ends up being quite thick. This is a good indication that they haven't reduced the anise bill as some brands might do. Aroma: punchy and herbal with lots of alpine aromas. Earthy and minerally with anise, wormwood, and coriander at the forefont. Flavor: earthy again. The anise comes out much more than you'd think from a brand that talks about being low anise. And I'm happy about that. Wormwood, mint, citrus, and peppery coriander are prominant. Certainly an absinthe, but one that's quite spicy and herbaceous. Enjoyable! Finish: anise recedes, while the other herbs stick around for a moderate length of time. Overall: Strong flavors in this absinthe will surprise some who might be looking for more delicate flavors. This one will wake you up with a bracing slap of herbs. A very nice first offering. Many times a distiller who first starts making absinthe will be light handed in fear of overdoing things. This one has not. And it turned out to be quite good. I think the producers are doing themselves a disservice by marketing themselves as a 'low anise' brand, as that will normally drive away a lot of absinthe enthusiasts who've been groomed to be wary of that term. I'm happy to have a bottle!